Electrolux Major Appliances North America has been named an ENERGY STAR Partner of the Year for Product Manufacturer by the U.S. Department of Energy (DOE) and the U.S. Environmental Protection Agency (EPA). The award recognizes Electrolux for increasing their selection and delivery of environmentally-conscious ENERGY STAR qualified appliances and helping to educate consumers about the ENERGY STAR program. Award winners are selected from more than 20,000 organizations that participate in the ENERGY STAR program. In 2010, Electrolux encouraged consumers to recycle old appliances and replace them with ENERGY STAR qualified appliances through the Swap and Save program, which so far has saved U.S. consumers more than $240 million dollars in energy savings and more than 7.4 billion gallons of water. Electrolux’s premium collection of kitchen and laundry appliances includes ENERGY STAR qualified appliances in every product category, where applicable, offering a wide variety of sleek and stylish appliances that are at least 10% more energy-efficient than non-ENERGY STAR qualified appliances. • Electrolux dishwashers use at least 41% less energy and 40% less water than was used just 10 years ago. In fact, Electrolux dishwashers use five gallons of water per load versus 27 gallons for hand washing – a savings of nearly 70,000 gallons of water over the life of the appliance. • Electrolux also offers eco-friendly washers that are up to 161% more energy-efficient (1) and use 63% less water than washers from just ten years ago (2). • Electrolux offers more than 30 refrigerators that are ENERGY STAR qualified and exceed the minimum standards by 30% or more. 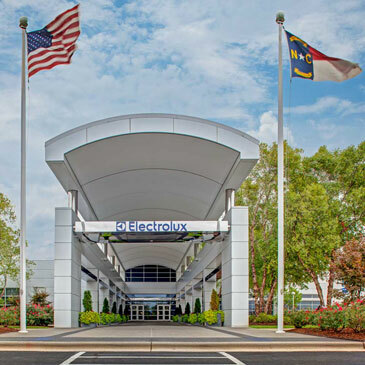 Electrolux applies this commitment to operational efficiency as well. Electrolux is recognized as leader in the Durable Household Products category in the most recent Dow Jones Sustainability World Index. As part of its sustainability strategy, the Company has committed that by the end of 2012, its factories, offices and warehouses will use 28% less energy than in 2005 and had achieved a 25% reduction versus 2005 at the end of 2010. Additionally, Electrolux has set ambition targets related to water usage and transportation emissions reduction globally. For more details about Electrolux’s commitment to living green and to access our Energy Savings Calculator, visit electroluxappliances.com/livinggreen or facebook.com/electrolux. The entire Electrolux line of stylishly-designed appliances, which boast a distinctive curved-front design, signature blue LEDs electronic controls and first-in-class features is available nationwide through select independent appliance dealers and at Best Buy, Lowe’s and Sears. (1) Energy efficiency based on current DOE Federal minimum standard for washers based on MEF. (2) Water savings based on ENERGY STAR® energy-savings calculator.